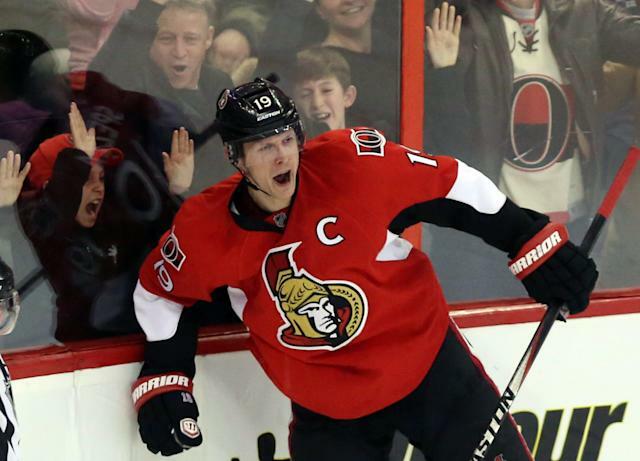 PHILADELPHIA – An Ottawa Senators player wants out. He has a no-trade clause that can influence his future home. His general manager finds a taker, and has a deal in place. But it’s not a team the player wants to go to, so he kills the deal; a fact that the general manager then relays to the media in a show of public humility. If this sounds like Dany Heatley, circa 2009, that’s because Bryan Murray was the general manager then and is the general manager now, as he contends with the same scenario with center Jason Spezza. Murray said on Saturday that Spezza killed a potential trade with the Nashville Predators, a team that Spezza reportedly had on his limited no-trade list. “I’ve talked to Bryan about Jason, and I was told by [Spezza] and his agent that he didn’t want to come here, and that was confirmed by Bryan,” said Predators GM David Poile. It was a decision that frustrated Poile, who made an aggressive move on Friday to add Pittsburgh Penguins winger James Neal. He sees Nashville as a team on its way back to contender status, and a city that offers a great home for NHL players. Did he pitch Spezza personally on coming to Nashville. “I didn’t. I could have, but I didn’t after he said he didn’t want to come here,” he said. “I’m not going to pitch somebody if they don’t want to play for us. You have to be committed. Poile said the Predators have made adding a No. 1 center their priority, although not with too much urgency. He hopes Neal baits the hook to lure a free agent center to the Nashville, but he also believes in the collection of young forwards the Predators have with Filip Forsberg, Calle Jarnkrok and others. He sees the Predators as a team on the rise. He doesn’t see how Jason Spezza didn’t share the sentiment. “I don’t get it. When you talk about winning and losing, I know you want to go to a team to win a Cup, but we’re as committed as anybody. Who knows, maybe we’re closer than anybody thinks,” he said. “You have to sell your team all the time. But there are teams that are national TV or major markets. I get that. But what we have on the ice, what we have off the ice, no state taxes. There’s a lot of advantage to playing in Nashville. But you can ask Peter Forsberg what he thought about Nashville, or Paul Kariya, just to drop a few names of players who might be going to the Hall of Fame." The Predators, however, won't be adding Jason Spezza to that list of stars. “I get it. That’s the way the world is right now. There’s a lot of entitlement," said Poile.